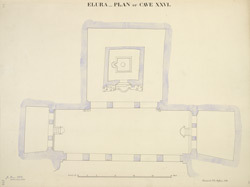 Plan of Cave XXVI, a Hindu cave temple dating from the late sixth century at Ellora from James Burgess' 'Original Drawings [of] Elura Cave Temples Brahmanical and Jaina, IIII.' The spectacular site of Ellora, in Maharashtra, is famous for its series of Buddhist, Hindu and Jain cave temples excavated into the rocky façade of a cliff of basalt. The works were carried out under the patronage of the Kalachuri, the Chalukya and the Rashtrakuta dynasties between the sixth and the ninth centuries. Cave XXVI is very like Ramesvara in plan. The hall is 74 feet wide by 25 feet deep and 16.5 feet high, with four pillars in front. At each end is a large irregular-shaped room at a somewhat higher level, with two square pillars and pilasters in front, and at the back is a still larger one, about 40 feet square, also with two square pillars and pilasters in front. In the middle of this stands the shrine, about 16 feet square inside, and with a circumambulatory passage about 9.5 feet wide all round it. The entrance of the shrine is richly ornamented with sculptured figures, and female statues stand by the pilasters on each side the entrance to the side passage.